Turkey, oats, chickpeas, turkey liver, turkey heart, broccoli, green beans, squash, turkey gizzard, quinoa, cane molasses, cranberries, salt, mixed tocopherols (preservative), rosemary extract. Click Here for more nutritional information. Owner should always supervise their pet when feeding this treat. Treats should be no more than 10% of your dog's daily calorie intake. 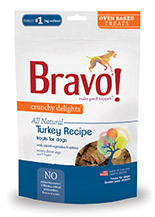 These treats are not a substitute for your dog's main meal. They are for intermittent or supplemental feeding only. Note: These are guidelines ONLY. ALWAYS seek the advice of a qualified veterinarian or veterinary nutritionist for more detailed advice, especially if you have a special needs dog or cat with a health condition. © 2019 Bravo, LLC. All Rights Reserved. Product of USA.